Due to the nature of the making process for the vase (glass blowing into a plaster mould), the opportunity to infuse my own choices back into the object presented itself. The result is one vase as determined by the process and 3 additional ones that follow the general shape, with all other details chosen by myself. The image is of an object that is somewhat cylindrical in shape, tapering off at the top to a thicker rim. The body of the object appears to be made of glass, or a hard, transparent plastic. The rim is rounded and would appear to be circular in shape, consistently thick around the entirety of the top of the object. The body is also filled with a clear liquid, likely water, that fills the object a bit more than halfway past its total volume. The bottom of the object has some sort of plastic or rubber base, which is mostly grey in color but connected to a second portion on the bottom that appears to be irregularly shaped, much like the treads on a shoe. This part could be made of rubber and meant to keep the object in place and prevent it from sliding around on different surfaces. The grey portion appears more plastic in texture and has open portions around the middle which expose the base of the glass/plastic main body, which also shows that the base is thicker than the rest of the body. It is similar to the rim of the body, but it is not quite as wide and the base appears thicker because the bottom portion does not open up the way that the rim does. The grey plastic portion seems to lock into the rubber bottom so that the entire object is composed of three interlocking pieces. This keeps the rubber bottom portion attached to the smoother glass/plastic body by the grey portion, which would give the entirety of the object a more solid base that is less likely to slide around without sacrificing its stability. In other words, the width of the base, which is slightly wider than the glass/plastic base (but not quite as wide as the rim), being comparable to the rest of the object—as opposed to being thinner or much wider—means that it is less likely to fall over. The grey plastic and rubber component appears to attach to the rest of the item by four tabs, which extend higher than the rest of the object, and are connected to one another by thin grey plastic pieces. These pieces are not uniformly wide, and extend higher in the middle in a rounded fashion, underneath which portions of the glass/plastic body’s base can be seen. The rubber base locks into the grey tabs and can be seen underneath a slot in the top part of the tab, which shows the glass/plastic body. The opening that reveals the rubber base is rounded but square at the bottom and more rounded at the top, suggesting that it locks into place by sliding in and locking into the tab, the bottom portion of which prevents it from sliding back out. Underneath the tab portion, and under the slots, the bottom of the rubber base is thicker under each of the tabs. There appear to be four tabs total, equidistant from one another around the base of the glass/plastic body. The object overall would work as a glass receptacle, either a drinking glass or a vase of some sort, whereas the plastic and rubber base can be added later to prevent it from tipping and from sliding around. The object is made of glass, and has a metallic base. It is a cylindrical container, that is more tapered at the top. The metal base is similar to a bottle cap, how it has those little grooves or notches spaced apart equally. The light is reflecting off the glass on the left side facing us. 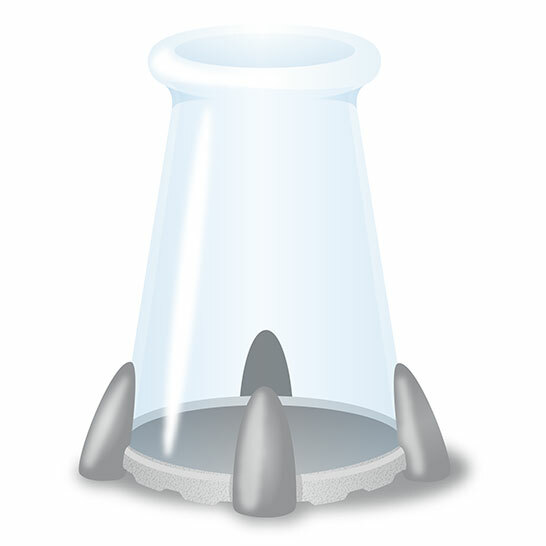 There are four cone things, shaped sort of like fingernails, going from the bottom of the cylinder, at the metal base, about 1/5 or 1/6 of the way up. The "fingertip" is at the top, and the widest part is at the floor at the bottom. They are dark grey, just a couple shades lighter than the metal base. The metal base that you can see inside the glass is the same shade, because the light reflection appears to make it darker. The top of the cylinder has an opening, with a lip. It is like the top of a glass Coke bottle. Actually the slant of the glass cylinder is also like a glass Coke bottle. It is also similar to a glass beaker used in a laboratory, with a flat base and lip at the top for pouring in liquids. The four "finger nails" things are oriented in the front, two sides, and back of the glass. The front one is facing you directly on, and the back one you can see through the glass, in the same position. The size of the object would cover your entire computer screen up and down if you were using an average laptop. Width wise it would cover probably a little over a third, right to left. The metal base also seems to be speckled a bit, with many small darker areas of grey. There is a small shadow under the lip at the top, from the light reflecting off of it. This object is a vessel probably primarily made of glass, although it could be made of a transparent plastic, such as acrylic. The vessel has a relatively short and stout neck, which ends in a round opening with a glass lip around the edges. The neck flares from a base that is about two and a half times the width of the neck. The sides of the vessel are straight until they flare toward the neck and opening. The sides of the vessel are slightly taller than the portion comprised of the flared part leading to the neck and opening. The glass material is colorless and transparent. The round base includes a band that rims the circumference. The band has a metallic look with small dark flecks. The band is encircled in a row of indented narrow columns like stripes. In addition, the band's exterior is held by four tab-type structures. These structures extend from under the base to over the band and onto the glass sides of the vessel. The structures are spaced at equal intervals around the base. These tab-like structures are shaped like half-ovals and resemble arrow tips. The height of the tabs is about double the height of the band encircling the base. Within the vessel, the base appears to be flat with a rim or lip around its circumference. The tab on the opposite side casts a dark reflection shaped like an oval or droplet, which appears to extend above the front-most tab. The tabs themselves are light in color and solid-colored. They appear to be made of resin, plastic or matte metal. This object probably serves as a vessel for liquids, and the neck and opening suggest that it is useful for pouring liquids as well as holding them. The band around the bottom held by the tabs could be a type of screw-on lid, allowing the user to remove it in order to empty or access the vessel. The flat base suggests that the object is meant to be upright. The object looks like something used in a chemistry lab or medical laboratory, and its size might range from a pint to a liter; however, it lacks any markings that serve as a gauge of volume. This appears to be a glass vase of some sort with handles for ease of carrying. The vase appears to be approximately eight to ten inches tall, six inches wide at the top, about four inches wide at for the main section and slightly wider at the base. The main part of the object is clear glass. The bottom of the vase is roughly beaker shaped with a wide opening at the top shaped like a funnel, getting smaller and smaller, to the main tube. It has a wide opening at the top with rounded edges and is approximately six inches wide at the top, getting narrower as it goes down. 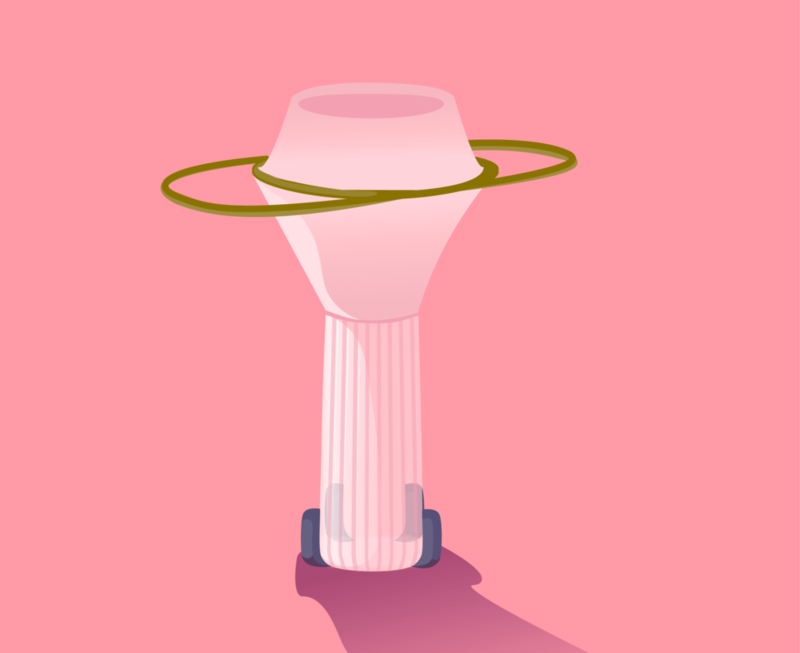 After three or four inches, it takes a tube shape, roughly four inches in diameter. There is a small, noticeable line in the glass where the funnel shape ends and the beaker shape begins. The tube continues down for another six to eight inches where it then flares out for a base that is maybe a half inch wider - a quarter inch in each direction – than the tube itself. There looks to be wave-shaped lines in the thick base of the glass. These waves start at the bottom of the thick base and arch up nearly to the top. There are a number of these waves and I assume, since I can't really see it, that these waves encircle the entire base. There are four small, what appear to be gray plastic pieces attached to the bottom. The pieces are approximately an inch wide at their widest. They are spaced equally around the base and go about an inch and a half up the side of the tube. They wrap over the flared base then disappear under the beaker. The tips of the plastic pieces narrow down to points at the top. There are two handles around the neck of the glass vase, right beneath the funneled top. These handles, made of the same material, arch up over the top of the vase, rising about three inches above the top of the funnel-shaped top. The handles, for lack of a better word, appear to run parallel up and over to attach to the other side of the collar. The two handles do not cross each other, they run beside each other. Depicted here is a vessel made from a clear material, which in my opinion most likely is made of glass. The top part is roughly a 5th of the total height, and can be described as funnel shaped. The lip or rim of the object is consistent throughout in its thickness. The funnel, or upper part meets the lower part where the funnel tapers and becomes approximately half its initial circumference. From there on the object is cylindrical, until about 2 inches before its base touches the surface it rests on. Whereas the majority of the cylindrical part is of the same circumference, the last 2 inches of the object are tapering outwards once again, possibly in order to distribute the weight more evenly and give the object a sturdier stand. On the base and halfway up the cylindrical shape are grey stripes, which seem to not serve any purpose besides a decorative one. They are not transparent and seem to adhere to the glass body. I estimate the total height of the object to be approximately 15 inch, with varying diameters throughout, as mentioned previously. This would suggest that the object is used as a vessel, for example a vase for flowers or an urn, which would in part explain the carrying handles attached around the funnel shaped upper part. These handles are attached around the meeting point of the upper and lower part, running around the whole object, and going up and outwards, making it possible to carry the object without touching and staining the glass. The material of the handles is hard to determine, but I reckon it would be made from leather or metal, not plastic, as the whole object has a luxurious feel to it.